Keywords: chronic venous leg ulcers; pain; foam dressing releasing ibuprofen; health-related quality of life. Changes in wound pain intensity, relative ulcer area and health-related quality of life were studied in ten patients with chronic venous leg ulcers treated with compression bandaging and a foam dressing releasing ibuprofen. A common experience of unrelenting, persistent wound pain and intermittent bursts of intense, spontaneous pain were discovered. Key themes identified were the unpredictability and unrelenting nature of the ulcer pain and the challenge of living with fatigue and restrictions on activities. The findings demonstrate that persistent wound pain fluctuates over a 24-hour period and can be difficult to control. Nine out of ten patients in this case series reported overall pain reduction and improved mobility, sleep and mood during the study. This prospective case series examined ten patients with painful chronic venous leg ulcers who were treated for six dressing changes with a foam dressing releasing ibuprofen (Biatain-Ibu) and appropriate compression bandaging. The aim of the case series was to profile the characteristics and experience of these individuals. Endpoints of the study were change in wound pain intensity, relative ulcer area and health-related quality of life. The findings demonstrated that these patients experienced persistent, severe wound pain with intermittent bursts of intense spontaneous pain. Nine out of ten patients reported overall pain reduction, improved mobility, sleep and mood during the study. Pain intensity scores decreased during the study but increased one week after discontinuing treatment. Over the past 15 years numerous studies have provided evidence that people with chronic venous leg ulcers (CVLU) have a reduced health-related quality of life (HRQoL). Effects on the quality of life of this client group have been investigated using both generic and disease-specific assessment tools  and qualitative approaches that describe the patient's experience . The negative effect on HRQoL in leg ulcer patients is caused by many inter-related factors including wound odour, exudate leakage, skin problems, pain, restricted mobility, lack of sleep and increased frequency of dressing and bandage changes . For those with non-healing ulcers this may lead to loss of independence, lack of energy, mood changes and social isolation . For some this may result in depression, loss of self-esteem, anger and high levels of anxiety . Wound pain is consistently reported by patients as the most prominent feature of CVLU . The prevalence of pain in CVLU has been reported to be as high as 64%. Venous leg ulcer pain can be persistent, even at rest , or may be specifically related to, and exacerbated by, wound dressing-related procedures . There are two physiological types of pain: nociceptive and neuropathic. Nociceptive pain is defined as the normal physiological response to a painful stimulus . Soft tissue injury associated with nociceptive pain causes inflammation and stimulation of peripheral nerve endings. The resulting hypersensitivity means that even minor stimulation can cause intense pain. Neuropathic pain is caused by a primary lesion or dysfunction in the nervous system  and may be caused by nociceptive pain, ischaemia, diabetes or trauma that has damaged the peripheral nervous system and altered the pain response. An individual's experience of wound pain is complex and is influenced by a wide range of factors unique to them . Pain has a strong emotional dimension that is influenced by previous experience . Therefore it is no surprise that reduction of pain is frequently cited as the highest treatment priority from the patient's perspective . The importance of adequate pain management associated with chronic wounds is now becoming recognised in clinical practice because it can significantly improve patient's HRQoL and may indirectly promote healing by improving appetite and sleep . People with painful CVLU feel their misery is never ending, Chase et al  coined the term 'forever healing' to describe the extended time over which healing occurs. The chronic illness experience of leg ulcer sufferers is dominated by persistent pain. Strauss et al  and Miller  refer to this experience as the patient's illness trajectory. Improvement of the illness trajectory of people with CVLU requires effective management of wound pain, thus further studies on the impact on HRQoL of pain-relieving treatments are urgently needed. This article describes the experiences of a group of patients with CVLU being treated with a non-adhesive foam dressing releasing ibuprofen (Biatain-Ibu). The dressing consists of a soft, hydrophilic, non-adhesive polyurethane foam containing ibuprofen (ibuprofen concentration: 0.5mg/cm2) as an integral part of the matrix. The foam is bonded to a semi-permeable polyurethane film. Ibuprofen is released to the wound in the presence of wound exudate and a study has shown that the dressing provides a continuous pain-relieving effect . In exudating wounds ibuprofen will be released in therapeutic concentrations into the wound bed. A limited pain reduction effect could be due to many additional variables that affect the individual pain experience. No relationship was observed in this study between amount of wound exudate released and pain reduction. The release of ibuprofen is limited in a dry wound environment and therefore the presence of dry necrotic tissue will impede any pain reduction. There was no evidence in this study that moist slough interfered with the release of ibuprofen. Profile the characteristics and experience of individuals suffering from painful venous leg ulceration. Describe the experience of having a painful CVLU treated with a foam dressing releasing ibuprofen. The use of a prospective case study design allowed a more comprehensive description of the pain experienced by people with CVLU and provided a richness of information that cannot be conveyed adequately in a randomised controlled trial. When considering the philosophical assumptions associated with qualitative research it became apparent that a prospective case series was the methodology of choice. The use of a control group was not considered in this instance as the study was not trying to demonstrate a treatment effect. It is hoped that the description of the characteristics of CVLU pain may highlight the potential for new pain-reducing therapies, leading to focused studies of stronger design in the future. 'between-method', involving quantitative and qualitative data collection approaches within one study . Multiple triangulation analyses data from a variety of sources to provide a deeper understanding of complex issues and encourages researchers to consider the data in the widest possible way, instead of accepting findings from one methodological paradigm. One of the original purposes of triangulation was to seek confirmation of findings. In order to answer the research questions effectively, contrasting types of data collection were used, including visual analogue scores (VAS), wound swabs and ankle brachial pressure index (ABPI) measurements, in an attempt to enhance the final analysis. Much health-related research now uses triangulation as a blended, pragmatic approach to gain an in-depth understanding of the phenomena in question . Both quantitative and qualitative approaches were seen as having equal value so that findings from different perspectives could be evaluated . This was considered to be important when exploring the complex and highly personal nature of an individual's pain experience. See Figure 1 for an overview of the study. Figure 1 - Overview of study. The study was carried out in Denmark and was conducted in accordance with the Declaration of Helsinki. The study protocol was submitted to a local ethics committee and written approval was obtained before inclusion of any participants in the study. Written informed consent was obtained from all participating patients, after written and verbal information was given regarding the nature of the study. Participants were free to withdraw from the study at any time. A case series design uses fewer samples more intensively than a quantitative study . Participants were recruited purposefully to enable exploration of their experiences of living with CVLU (see Table 1). In total, ten patients were recruited from a wound clinic in a district general hospital. Data collection began in May 2004 and was completed in July 2005. All data collection was completed by two research nurses: one conducted the participant interviews and the other was responsible for all dressing changes. Once participants were recruited into the study, all care and data collection occurred in their own homes. All research instruments were piloted on one patient who was excluded from analysis as minor protocol modifications were implemented. change in ulcer area before and after treatment. Wound type Painful chronic venous leg ulcer, with an ABPI of 0.8 or higher. Moderate to highly exuding. Wound size More than 2cm², but at all places the dressing edge must exceed the wound edge by a 2cm margin. Wound pain Wound pain score of 3 or more on a VAS 100mm scale. Patient Male or female over 18 years old. Patient suitability Patient must be evaluated as suitable for inclusion into study by investigator. Patient consent Patient must sign patient consent form before inclusion. Serious illness Signs/symptoms of clinical infection. Systemic treatment with corticosteroids or other immunosuppressants in study period or within past month. Active vasculitis, systemic lupus erythematosus, rheumatoid arthritis. Diabetes. Treatment with cytostatika within the past six months. Pregnant or breastfeeding Patient is pregnant or breastfeeding. Allergy Patient has known allergy of dressing constituents. Patient has known allergic reaction to ibuprofen, aspirin or other similar pain-relieving drugs. Compression Patient must wear compression bandages. Participation in other clinical trials Patients must not be participating in other clinical trials. Each participant's leg ulcer was cleaned and dressed with the foam dressing releasing ibuprofen for six dressing changes, followed by treatment with a non-pain relieving foam dressing (Biatain) in the non-active treatment period (Figure 1). Dressings were changed every two or three days, extending the treatment period over two weeks. One patient had a four-day period between dressing changes. The frequency of dressing change can influence the pain experienced by patients. Krasner conceptualises wound pain into two types: acute and chronic . Acute wound pain is associated with procedures such as dressing changes and debridement, while chronic pain refers to background, persistent pain associated with wounds. Patients in this study experienced both types of pain; however, intense exacerbations of pain were experienced at dressing changes but also occurred at other times of the day for no specific reason. During the study, wound management was standardised using a protocol (Table 2). During dressing changes, the nurse observed and recorded participants' verbal and non-verbal cues. Leg ulcers to be cleansed with normal saline or tap water and the surrounding skin patted dry. The dressing should overlap the wound margin by 2cm and may be cut to fit if necessary (dressing size 15 x 15cm). The dressing should be applied with the foam side towards the wound surface. The dressing may be secured with a secondary dressing or compression bandage. The dressing must be changed when required, but not remain in situ for longer than seven days. Dressing changes of between two and four days are preferable. Compression bandaging was used as standard for all participants. Demographic data were collected, including participant age, gender, height, weight and past medical history, together with wound-related data. Details of all medication taken by participants at the beginning of the study were recorded at initial assessment. Participants were asked to note how much analgesic medication they took during the study and to record it in their personal diaries. They were asked to keep their analgesic medication levels constant for the duration of the study. The fact that this variable was not controlled should be borne in mind. A standard leg ulcer assessment form was used to record ulcer details, including: previous history, duration, location, aetiology, exudate levels, status of wound bed and surrounding skin, wound size and type of compression therapy used, in accordance with current recommended practice . The aetiology of each leg ulcer was confirmed following full clinical examination and measurement of the ABPI. Only participants with venous leg ulcers as indicated by an ABPI of 0.8 and above were included in the study in order to exclude people with mixed or ischaemic ulceration because this could have influenced the individual's pain experience . At each dressing change patients were assessed for any clinical signs of wound infection that could indicate a rise in the wound’s bioburden and account for increased wound pain. A wound swab was taken for microscopy, culture and sensitivity at the start of the study to exclude infected wounds because infection is known to influence wound pain . Wound dimensions were recorded using wound tracing sheets and surface area calculated using planimetry. The presence of inflammation was visually assessed at the wound margin by the project research nurses, who recorded whether or not erythema was evident. Finally, a digital photograph was taken of each ulcer at the beginning and end of the study. The intensity of venous leg ulcer pain experienced during the 24 hours before the study began was measured using a validated visual analogue scale (VAS). Participants completed a 100mm pain intensity horizontal VAS (least possible pain to worst imaginable pain), which has been shown to be a successful method of measuring pain intensity . The assessment was repeated immediately before removal of the sixth and final dressing and one week after removal of the active dressing. In line with established practice, previous scores were not shown to participants. Participant diaries and interviews were used to substantiate VAS scores. Individual interviews were conducted with participants at the start of the study and lasted approximately 40 minutes. Semi-structured interview schedules focused on participants' experiences of leg ulcer pain (Table 3a). Participants agreed to complete written personal diaries describing their experiences of leg ulcer pain over the study period of two weeks. Individual interviews were held with participants at the end of the active treatment period (Table 3b). The timing of this interview encouraged reflection over the entire treatment period. One week after removal of the foam dressing releasing ibuprofen participants had a follow-up visit and were asked to evaluate their pain. What does it feel like to have a leg ulcer? Daily activities, mood, concerns/worries. Try to describe the pain. Location, intensity, frequency, duration, things that alter the pain. Describe how the pain affects your life. Activities, energy levels, sleep, mood, friends and family, compression bandage. What helps to ease the pain? Pain-relieving strategies: medication, distraction, heat, massage, talking about it, effectiveness. How have you been since the first interview? Overview of effect of dressing: activities, mood, concerns/worries. Describe how the ulcer pain has been since the first interview. Location, intensity, frequency, things that alter the pain. If pain has changed describe how. Describe how the pain has affected your daily living since the first interview. Activities, energy levels, sleep, mood, friends and family, compression bandage. How effective was this dressing? Did it relieve the pain? Speed and duration of effect, comfort, overall satisfaction, other effects. Data analysis was performed using data from the ten patients on the validated statistical software 'R' version 2.10. Pair-wise comparisons between VAS scores for baseline and final dressing change and between final dressing change and follow-up were tested with a paired T-test. Similarly, pair-wise comparisons between wound sizes were tested with a T-test; a correlation analysis was performed on baseline wound size and pain. An analysis of variance (ANOVA) was performed with VAS reduction (%) as a response variable and with the following explanatory variables: patient age, reduction in medication, gender, duration of ulcer and previous ulcers. If a variable tested insignificant it was successively removed until all variables were significant. Data analysis of participant interviews was conducted simultaneously with data collection in order to allow follow-up in subsequent interviews and was based on the principle of data 'reduction and interpretation' . Transcripts were read so that major themes could be identified. Participants' experiences were then coded. Interpretation was facilitated by looking for recurring ideas and patterns within the data and comparing these with the literature. The dominant and unrelenting nature of venous leg ulcer pain emerged as a central theme from the data. One participant described their situation as being 'locked in a shell of pain'. Two major themes, characteristics of pain and the impact of pain, will be discussed in detail, although many sub-themes were identified, which formed a complex network of inter-related issues. Verbatim quotations from participants are used to illustrate the depth and personal nature of participants’ pain experience. Five men and five women, with a mean age of 67.9 years (range: 45-86), took part in the study. All had chronic leg ulcers of longstanding duration, mean one year and four months (range three months to seven years). Leg ulcer size was reduced in eight out of the ten participants over the study period, but there were no significant differences between baseline and final dressing wound sizes (Figure 2). Table 4 summarises participant characteristics. Participant number 6's wound became infected during the study, which may account for its increase in size. VAS reduction depended on age (p = 0.02) and previous ulcers (p= 0.004) only, the rest of the variables were insignificant. This meant that younger participants had improved pain reduction with the foam dressing releasing ibuprofen. In addition, participants with a previous history of leg ulceration experienced less of a pain-reducing effect with the dressing than participants presenting with an ulcer for the first time. This corresponds well with the literature and emphasises that pain should be treated as fast as possible because long-lasting pain becomes more difficult to treat . Figure 2 - Wound size while wearing a foam dressing releasing ibuprofen. Table 4: Patient characteristics and results of pair-wise comparisons between observed VAS and wound size at inclusion and exclusion. Although the pain experienced by participants was described as originating from the wound surface, no relationship was demonstrated between the size of leg ulcer at initial assessment and the reported pain intensity (see Figure 3). This was confirmed by several participants during interview as they expressed a need for people to believe their pain. In the words of one woman, 'it's good to get the point made that it [the ulcer] hurts so much when it [the ulcer] didn't look like much' (her ulcer measured 5.9cm2 at the initial assessment). Figure 3 - Pain-reducing effect (VAS) of a foam dressing releasing ibuprofen. These vivid descriptions illustrate that the pain may be focused at the site of the wound itself (primary hyperalgesia), but extends to tissues peripheral to the wound (secondary hyperalgesia) . The mean baseline VAS score at the start of the study was 85mm (range 74-96). Several authors have examined the distribution of VAS scores in patients suffering various types of pain, including cancer pain, postoperative pain, osteoarthritis and back pain, and agree that a VAS score greater than 60mm is indicative of severe pain   . The intensity of venous leg ulcer pain experienced by patients in this study (mean 85mm) is greater than the mean score of 44mm reported by Noonan and Burge  in a similar client group. The mean baseline VAS score reduced from 85mm to 29mm (range 0-79) at final dressing change before gradually rising to 41mm (range 3-67) at one week follow-up. The pain intensity scores recorded during this study are shown in Table 4 and Figure 3. All participants reported an overall reduction of pain over the two-week study period and a gradual return of pain at one week follow-up. Pain was reduced significantly (p=0.003) in eight out of ten participants during the treatment period. All but one participant reported a rapid decrease in pain between 30 minutes and a few hours after application of the first dressing. Most patients expressed a reluctance to withdraw from active treatment because they had experienced considerable pain reduction during the active phase of the study. The results showed that eight out of ten patients experienced increased pain when active treatment was discontinued (Figure 3). In common with other studies, a consequence of leg ulcer pain for the patients in this study was restricted mobility leading to periods of inactivity and social isolation. This was a source of frustration  . This study suggests that elderly, Danish leg ulcer patients appear to be generally more active than contemporaries in other countries . A high level of mobility was evident during participant interviews: almost all were walking relatively long distances despite having intense pain, and many still enjoyed cycling. Several elderly participants had recently given up swimming, badminton and keep-fit classes because of worsening pain. As treatment progressed, participants in employment returned to work and were able to work longer days than previously. A significant improvement was also observed in the participants' gait during treatment. The majority noticed that their walking had improved because they had been walking on tip-toe in an attempt to limit the pain originating from the ulcer and this affected their mobility and confidence. Disturbed sleep meant that many participants had to rest in the day, which further reduced their activity levels and created anxiety about housework and chores and limited social interaction. For some, the need to walk day and night to dissipate the pain was a major source of exhaustion and, ironically, several participants associated increased daytime walking with the vicious cycle of worsened night pains. Many frequently woke up between 3am and 4am with sharp stabbing pains that required them to get up and start walking, which also disturbed the sleep of others. All participants felt more positive as a result of improved sleep and felt that it would help their ulcers to heal. The final patient interviews at the end of the active treatment period showed that nine out of ten participants experienced rapid and immediate pain reduction. Pain was reduced within 30 minutes to four hours, with the most frequent response being between 30 minutes and one hour. Furthermore, the duration of the pain-reducing effect was variable, ranging from relief during the first day with pain gradually returning at night, to five days of continuous pain relief. 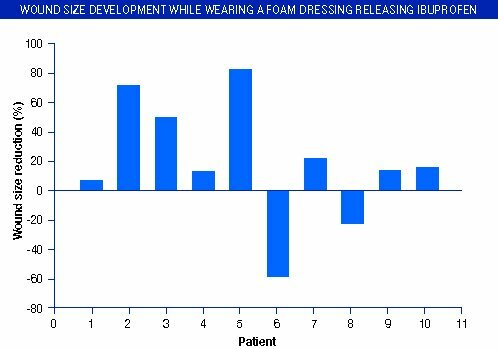 Five participants (50%) reported continuous pain relief of two to three days following dressing application. As the pain lessened participants relaxed and felt more positive that their ulcer would eventually heal. However, an unwelcome consequence of reduced wound pain meant that some people became more aware of other general aches and pains such as joint pains, backache and headaches. Despite being asked to keep analgesic medication consistent throughout the study five participants decided to reduce it as their pain reduced. Figure 4 shows the overall reduction in amount and strength of analgesic medication taken during active treatment. If participants had not been instructed to keep their medication constant, it is likely that a larger reduction in analgesic intake would have been seen. Three participants with a reduction of VAS scores of 53, 71 and 73mm did not alter their medication as they followed the instruction given not to reduce analgesia. Participants exhibited a general reluctance to take oral analgesia due to concerns about side effects and dependency and confusion about administration and dosages. This tendency has been reported in other studies . For most participants, their prescribed analgesia had only a limited effect by taking the edge off the pain and were only taken as a last resort. 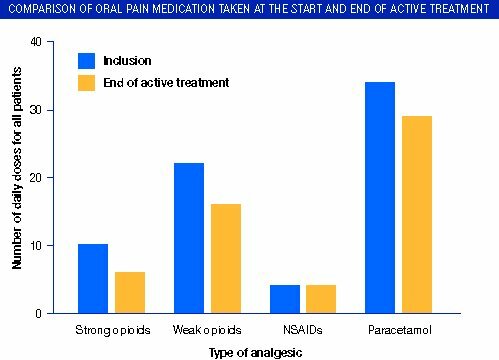 Only one younger participant appeared to understand the rationale for sustained, regular administration of oral analgesics. Figure 4 - Comparison of oral pain medication taken at the start and end of active treatment with a foam dressing releasing ibuprofen. During the follow-up interviews one week after active treatment had stopped, eight out of ten patients described a gradual return of the persistent ulcer pain but to a less intense level than before (Figure 3). For the majority of the patients the persistent pain typically returned between six and 12 hours after removing the last active dressing, although their dressing-related pain at subsequent dressing changes was reported to be less severe. VAS scores for two patients showed minimal pain reduction. One reported no improvement in pain intensity throughout the treatment period but acknowledged that the dressing must have had more of an effect than initially scored as the pain returned with such severity after cessation of active treatment. The other reported pain reduction for the first two dressing changes before experiencing a gradual worsening of pain during treatment. At follow-up, this participant noted that the pain had returned to its pre-treatment intensity but confirmed that the persistent wound pain had become intermittent during the study and had since returned to a persistent high level. The nurse researcher who monitored this person for the duration of the study commented that her pain 'was "tattooed" into her experience of living with a chronic wound'. Another interesting observation made by the nurse who interviewed a 65-year-old female participant with her first leg ulcer of seven months' duration was that 'it has been possible to effectively reduce the [ulcer] pain, which has not had time to develop into a chronic pain experience'. Walshe  indicated that pain-reducing interventions were sometimes reported to be inefficient due to negative expectations, increasing age and previous experience. The two participants who responded least well shared these reported characteristics. They were both over 70, had tried a lot of other unsuccessful treatments and were resigned to their ulcer pain. In addition, there was evidence that one wound was infected and that the other person's wound pain was likely to be primarily neuropathic in origin. NSAIDs such as ibuprofen are targeted for nocioceptive pain arising from tissue damage . The reduced effect of the active dressing in one participant suggests that a neuropathic pain element arising from nerve damage was more significant than the nocioceptive component. This effect may inform the clinician about the nature of an individual's pain and be helpful during the ongoing process of pain assessment. Case series traditionally have been relegated to the lowest rungs of the evidence hierarchy  because, in the past, isolated observations were collected in an uncontrolled, unsystematic manner so that the information gained could not be generalised to a larger population of patients. The quality of all studies, including randomised controlled trials, vary widely and depend on the quality of their design, execution and interpretation. However, case series studies are vulnerable to bias, which is why a protocol was followed during this study for the wound management procedures, data collection/analysis and documentation. Triangulation has its critics because the trends emerging with the use of one method of data collection and analysis may not do so with another . In this study, findings were corroborated, resulting in a broader, more complete interpretive analysis that does not give greater accuracy, but adds breadth to the analysis. Measuring an individual’s perception of pain is notoriously difficult and is influenced by many uncontrollable variables. Local wound-related factors may account for the pain reduction described by participants and requires further investigation. The decrease in pain associated with the use of the active dressing could have been due to the absorption of local inflammatory mediators present in chronic wound fluid. Schofield et al  have recently examined perceptions of pain in elderly people. Their findings demonstrate that older people have low expectations of pain-reducing interventions and accept that pain is a normal part of their lives. Researchers and participants knew that the treatment dressing contained an active analgesic, which may have biased results. Care must be taken when interpreting VAS scores as a single entity because uni-dimensional rating scales fail to reflect the complexity of pain. Pain intensity ratings are known to vary on a daily basis and may be influenced by seasonal changes, mood and anticipatory pain and are therefore dynamic measures that could well be rated differently the following day . Therefore VAS scores should be interpreted with caution and only considered within the context of participant interviews, diaries and researchers' notes. The findings related to pain reduction in this study should be interpreted as indicative due to its qualitative design, although there is new evidence that pain reduction in CVLU patients is associated with the release of ibuprofen . 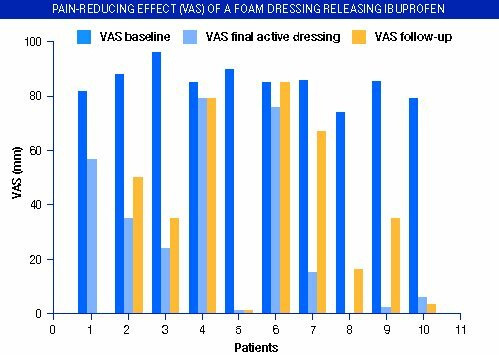 This study has attempted to describe the experience of living with a painful CVLU and how improvements in HRQoL occurred when treated with a foam dressing releasing ibuprofen. The data collectively revealed a range of experiences common to patients with venous leg ulcers, including unrelenting persistent pain, unpredictable ‘bursts’ of pain, fatigue and lives full of restrictions. The combined effect of persistent pain and spontaneous intermittent bursts of intense pain is debilitating and distressing for patients with venous leg ulcers. The lives of all participants were dominated by pain originating from their CVLU, with many finding it difficult to cope with the unpredictable nature of the pain. Analysis of demographic data, pain intensity scores, participant interviews and diaries highlighted that persistent wound pain, although present all the time, fluctuates over a 24-hour period and can be difficult to control. Persistent wound pain has a negative influence on sleep and daily activities. This study highlights the importance of thorough assessment to identify the characteristics of wound pain such as duration, intensity and type. However, the varying intensity of CVLU pain makes assessment challenging. Assessment could be improved if patients were encouraged to describe their pain experience over 24 hours so that patterns could be identified. This would allow targeting of appropriate interventions (Table 5). Findings showed that once pain was controlled, patients could 'forget' that they had leg ulcers and get on with living their lives. This emphasises the need to start pain intervention before anticipatory pain causes pain breakthrough. At what time of day is your pain* at its best and worst? What makes your pain* better and worse? *Note – patients may prefer to admit to aching, stinging or soreness rather than being in pain. Exploration of factors affecting the intensity of CVLU pain, for example ulcer duration, bacterial burden and sleep deprivation. How assessment of the intensity of wound-related pain could be improved. Evaluation of the effect of the new foam dressing releasing ibuprofen on other types of wounds. Findings support previous studies and provide further evidence that wound pain has a negative influence on HRQoL and normal daily activities of patients with CVLU. Use of this dressing was found to reduce wound pain significantly and improve health-related quality of life. This study is primarily interpretive in approach and does not intend to reflect the experiences of all people with painful CVLU, although it is becoming increasingly difficult to ignore the collective experiences described by other international studies. This study was partially funded by an unrestricted grant from Coloplast A/S, Holtedam 1, 3050 Humlebæk, Denmark. 1. Hopkins A. The use of qualitative research methodologies to explore leg ulceration. J Tissue Viability 2004; 14(4): 142-7. 2. Chase SK, Whittemore R, Crosby N, Freney D, Howes P, Phillips TJ. Living with chronic venous leg ulcers: a descriptive study of knowledge and functional health status. J Community Health Nurs 2000; 17(1): 1-13. 3. Holloway I, Wheeler S. Qualitative Research in Nursing. Second edition. Oxford: Blackwell Science, 2002. 4. Krasner D. Painful venous ulcers: themes and stories about living with the pain and suffering. J Wound Ostomy Continence Nurs 1998; 25(3): 158-68. 5. Hyde C, Ward B, Horsfall J, Winder G. Older women's experience of living with chronic leg ulceration. Int J Nurs Pract 1999; 5(4): 189-98. 6. Ebbeskog B, Ekman SL. Elderly persons' experiences of living with venous leg ulcer: living in a dialectal relationship between freedom and imprisonment. Scand J Caring Sci 2001; 15(3): 235-43. 7. Phillips T, Stanton B, Provan A, Lew R. A study of the impact of leg ulcers on quality of life: financial, social, and psychological implications. J Am Acad Dermatol 1994; 31(1): 49-53. 8. Persoon A, Heinen MM, van der Vleuten CJ, de Rooij MJ, van de Kerkhof PC, van Achterberg T. Leg ulcers: a review of their impact on daily life. J Clin Nurs 2004; 13(3): 341-54. 9. Walshe C. Living with a venous leg ulcer: a descriptive study of patients' experiences. J Adv Nurs 1995; 22(6): 1092-100. 10. Hofman D, Ryan TJ, Arnold F, Cherry GW, Lindholm C, Bjellerup M, et al. Pain in venous leg ulcers. J Wound Care 1997; 6(5): 222-4. 11. World Union of Wound Healing Societies. Principles of Best Practice: Minimising Pain at Wound Dressing-Related Procedures. A Consensus Document. London: MEP Ltd, 2004. Available from URL: http://www.wuwhs.org. 12. European Wound Management Association. (EWMA) Position Document: Pain at wound dressing changes. London: MEP Ltd, 2002. Available from URL: http://www.ewma.org. 13. Johnson L. The nursing role in recognising and assessing neuropathic pain. Br J Nurs 2004; 13(18): 1092-7. 14. Doyle D. Hanks G, MacDonald N, editors. Oxford Textbook of Palliative Medicine. Second edition. Oxford: Oxford University Press, 1989. 15. McMullen M. The relationship between pain and leg ulcers: a critical review. Br J Nurs 2004; 13(19): S30-6. 16. Lindholm C, Bjellerup M, Christensen OB, Zederfeldt B. Quality of life in chronic leg ulcer patients. An assessment according to the Nottingham Health Profile. Acta Derm Venereol (Stockh) 1993; 73(6): 440-3. 17. Enoch S, Price P. Should alternative endpoints be considered to evaluate outcomes in chronic recalcitrant wounds? World Wide Wounds 2004; available from URL: http://www.worldwidewounds.com/2004/october/Enoch-Part2/Alternative-Enpoints-To-Healing.html. 18. Glyn C. The control of pain associated with chronic leg ulcers. In: Cherry G, editor. The Oxford European Wound Healing Course Handbook. Oxford: Positif Press, 2002. 19. Chase SK, Melloni M, Savage A. A forever healing: the lived experience of venous ulcer disease. J Vasc Nurs 1997; 15(2): 73-8. 20. Strauss A, Corbin J, Fagerhaugh S, Glaser B, Maines D, Suczek B et al. Chronic Illness and the Quality of Life. St Louis, MI: CV Mosby, 1984. 21. Miller JF. Coping with Chronic Illness. Overcoming Powerlessness. Second edition. Philadelphia, PA: FA Davis, 1992. 22. Jørgensen B, Friis GJ, Gottrup F. Pain and quality of life for patients with venous leg ulcers: Proof of concept of the efficacy of Biatain-lbu, a new pain reducing wound dressing. Wound Repair Regen. In press. 23. Shih FJ. Triangulation in nursing research: issues of conceptual clarity and purpose. J Adv Nurs 1998; 28(3): 631-41. 24. Denzin NK. The Research Act. Third edition. London: Prentice-Hall, 1989. 25. Risjord MW, Dunbar SB, Moloney MF. A new foundation for methodological triangulation. J Nurs Scholarsh 2002; 34(3): 269-75. 26. Foss C, Ellefsen B. The value of combining qualitative and quantitative approaches in nursing research by means of method triangulation. J Adv Nurs 2002; 40(2): 242-8. 27. Yin RK. Case Study Research: Designs and Methods. Second edition. Thousand Oaks, CA: Sage Publications, 1994. 28. Stake RE. The Art of Case Research. Newbury Park, CA: Sage Publications, 1995. 29. Krasner D. The chronic wound pain experience: a conceptual model. Ostomy Wound Manage 1995; 41(3): 20-35. 30. Royal College of Nursing. The Management of Patients with Chronic Leg Ulcers Clinical Practice Guidelines. London: RCN, 1998. Available from URL: http://www.rcn.org.uk. 31. Kunimoto B, Cooling M, Gulliver W, Houghton P, Orsted H, Sibbald RG. Best practices for the prevention and treatment of venous leg ulcers. Ostomy Wound Manage 2001; 47(2): 34-46, 48-50. Available from URL: http://www.cawc.net. 32. Stubbing NJ, Bailey P, Poole M. Protocol for accurate assessment of ABPI in patients with leg ulcers. J Wound Care 1997; 6(9): 417-8. 33. Vowden P. Doppler assessment and ABPI: Interpretation in management of leg ulceration. World Wide Wounds 2001; available from URL: http://www.worldwidewounds.com/2001/march/Vowden/Doppler-assessment-and-ABPI.html. 34. Gardner SE, Frantz RA, Doebbeling BN. The validity of the clinical signs and symptoms used to identify localized chronic wound infection. Wound Repair Regen 2001; 9(3): 178-86. 35. Noonan L, Burge SM. Venous leg ulcer: is pain a problem? Phlebology 1998; 13: 14-19. 36. Mendoza TR, Chen C, Brugger A, Hubbard R, Snabes M, Palmer SN, et al. The utility and validity of the modified brief pain inventory in a multiple-dose postoperative analgesic trial. Clin J Pain 2004; 20(5): 357-62. 37. Miles MB, Huberman AM. Qualitative data analysis. Second edition. Newbury Park, CA: Sage Publications, 1994. 38. American Academy of Pain Medicine. The Necessity for Early Evaluation and Treatment of Chronic Pain Patient. A Consensus Statement. Glenview, IL: AAPM, 1997. Available from URL: http://www.painmed.org. 39. Schaible HG, Richter F. Pathophysiology of pain. Langenbecks Arch Surg 2004; 389(4): 237-43. 40. Serlin RC, Mendoza TR, Nakamura Y, Edwards KR, Cleeland CS. When is cancer pain mild, moderate or severe? Grading pain severity by its interference with function. Pain 1995; 61(2): 277-84. 41. Zelman DC, Hoffman DL, Seifeldin R, Dukes EM. Development of a metric for a day of manageable pain control: derivation of pain severity cut-points for low back pain and osteoarthritis. Pain 2003; 106(1-2): 35-42. 42. Lansbury G. Chronic pain management: a qualitative study of elderly people's preferred coping strategies and barriers to management. Disabil Rehabil 2000; 22(1-2): 2-14. 43. Senecal SJ. Pain management of wound care. Nurs Clin North Am 1999; 34(4): 847-60. 44. Mangwendeza A. Pain in venous leg ulceration: aetiology and management. Br J Nurs 2002; 11(19): 1237-42. 45. Sackett DL. Rules of evidence and clinical recommendations for the management of patients. Can J Cardiol 1993; 9(6): 487-9. 46. Fielding NG, Fielding JL. Linking Data. Newbury Park, CA: Sage Publications, 1986. 47. Schofield P, Dunham M, Black C. Older people: managing their pain in the community setting. J Comm Nurs 2005; 19(9): 24-29. 48. Hyland ME, Ley A, Thomson B. Quality of life of leg ulcer patients: questionnaire and preliminary findings. J Wound Care 1994; 3(6): 294-98.